When I commenced my research career in the early 1980s, I was attracted to the field of ion chromatography (IC) because of my Ph.D. background in inorganic analysis. The field of IC at that time was dominated by the commercial suppressed IC approach, which had been introduced a few years earlier. Suppressed IC involved the combination of a polymer-based ion-exchange column, a suppressor column which served the purposes of reducing the background conductance of the eluent and enhancing the analyte signal, and finally a conductivity detector. However, it was somewhat difficult to undertake fundamental, university-based research in suppressed IC at that time because patent protections on the commercial product created some limitations as to how the system could be changed. On the other hand, non-suppressed IC, which was only just starting to be developed, had no such restrictions and therefore offered a potentially fertile research area. Non-suppressed IC covered the use of any column type and detector for the separation of inorganic anions and cations and low molecular weight acids and bases. There was intensive research being conducted on what stationary phases and detectors could be used to enable inorganic species to be determined using conventional HPLC equipment (as distinct from the specialised equipment used in suppressed IC). In the period 1980–2000, the development of non-suppressed IC was rapid and quite a number of important papers appeared in Chromatographia during that time. However, I will concentrate on four publications: two of which are focused on new stationary phases and two are focused on new detection methods. IC separations were usually performed on some sort of ion-exchange column (silica- or polymer-based) and the separation selectivity was determined predominantly by the ion-exchange functional group (usually strong acid or strong base). Stationary phases which provided different separation selectivity were therefore highly attractive. Takeuchi et al. showed that alumina could be used for the simultaneous separation of inorganic anions and cations, with selectivity that differed from that of conventional ion-exchangers. The amphoteric character of alumina enabled it to act as both an anion- and cation-exchanger. Of particular interest was the separation of chlorine oxo-anions, with perchlorate being eluted first, before chlorate, chloride and then chlorite. This selectivity was almost opposite to that of strong base anion-exchangers where perchlorate was very well retained and was often difficult to elute. In an alternative approach, Tani and Suzuki  used titania as a packing material for non-suppressed IC and again the resulting separation selectivity was highly interesting. Sulfate was eluted first, followed by fluoride, which again was the opposite to that of conventional anion-exchangers. As was the case with alumina, anions and cations could be separated simultaneously. Both these papers showed the importance of considering new materials for ion-exchange separations and opened up the possibility for completely new separation selectivities. In terms of detection of ions, the mainstream detector used in IC was a conductivity detector. However, since most HPLC users did not have access to this type of detector there was strong interest in utilising a conventional UV detector, preferably coupled to a reversed-phase column. Dreux et al. showed how a reversed-phase column could be converted to a dynamic anion-exchanger through the use of an ion-pair reagent (typically octyl- or nonylammonium ions used with p-toluenesulfonate as the counter ion), coupled to a UV detector. The p-toluenesulfonate served both as the competing anion used to regulate the retention of analyte anions and also to facilitate indirect spectrophotometric detection. The latter feature arose because the ion-exchange process created a local deficiency of the competing ion when each analyte was eluted, so monitoring the background absorbance of p-toluenesulfonate at 254 nm resulted in negative peaks appearing when analytes were eluted. This paper showed that a conventional HPLC set-up could be used for IC, simply by choosing the correct eluent. This form of indirect detection in IC became widespread. The final paper I wish to include is here for sentimental reasons. In 1987 I spent some time in the US working with my good friend Jim Fritz at Iowa State University (ISU). Jim was the doyen of non-suppressed IC and was responsible for many major developments in this field. Ed Yeung was also at ISU at that time and when visiting his laboratory one day I was impressed by his array of fluorescence spectroscopy instruments. We had a discussion about the possibility of indirect fluorescence detection in IC, based on the same principle as indirect spectroscopic detection but with a fluorescent probe used in the eluent. Ed subsequently brought this idea to fruition  by showing that indirect fluorescence detection of chloride and nitrate could be achieved in an open-tubular capillary column using salicylate as eluent. 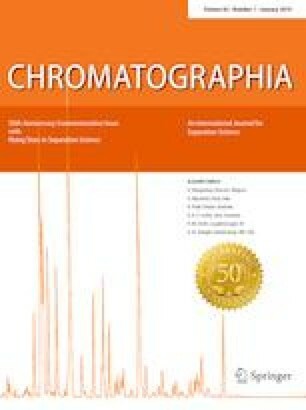 I congratulate Chromatographia on reaching its 50th volume and wish the journal every success in the future.